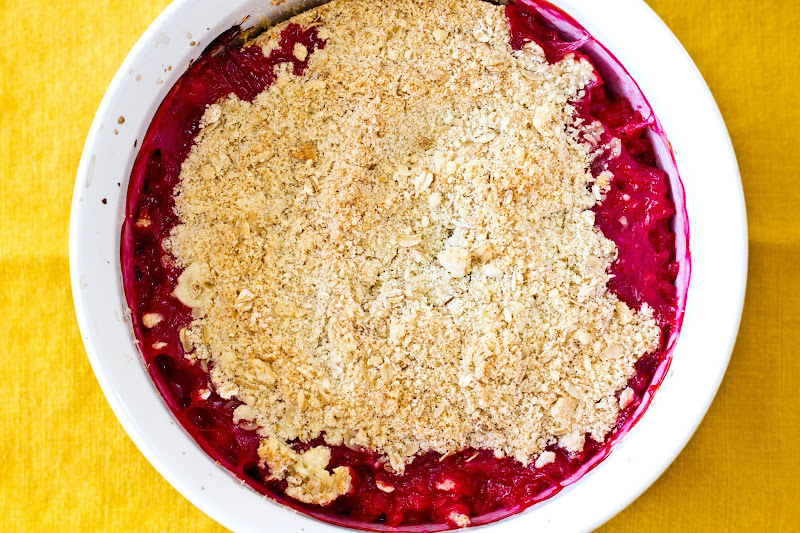 Two weeks ago, I made this lovely red currant crumble (crisp? sonker? slump? sneezy?) with the red currants given to me by my aunt and uncle from their amazing garden in Taos, New Mexico, which I struggle to refer to as a garden because it seems to be so much more than that as they have over 40 fruit trees as well as chickens and goats (from which my aunt makes her very own goat cheese). And despite the loveliness inherent in the fact that my aunt and uncle flew with these currants and goat cheese to Los Angeles and showed up at our doorstep on a Saturday afternoon before heading out to a wedding, and thereby, left me with all of the ingredients I needed to bake a crumble, what I really want to say to you is this: I didn't like Elysium. Matt and I saw it this afternoon, or rather, Matt saw it and I saw about thirty percent of it during the time I wasn't covering my eyes and ears. This was a rare occasion where we went into it without having watched the trailer and generally knowing very little about the movie apart from seeing these kind of cool advertisements reading, "Affordable Homes Starting at $250 Million on Elysium." For some strange reason we both had this vague idea that it would be a thoughtful, interesting, possibly even Kubrick-ian(!) dark comedy that takes place in the not too distant future and that might subtly and intelligently touch upon current, hot-button issues like the growing wealth gap, climate change, immigration reform, love, death, etc. Plus, it's got Damon, y'all! But alas, it was nothing more than a super (duper) heavy-handed action movie. Very little of the movie is not an explosion-driven action sequence and there's no nuance to any of the interesting elements of the high concept. Preheat the oven to 350F. 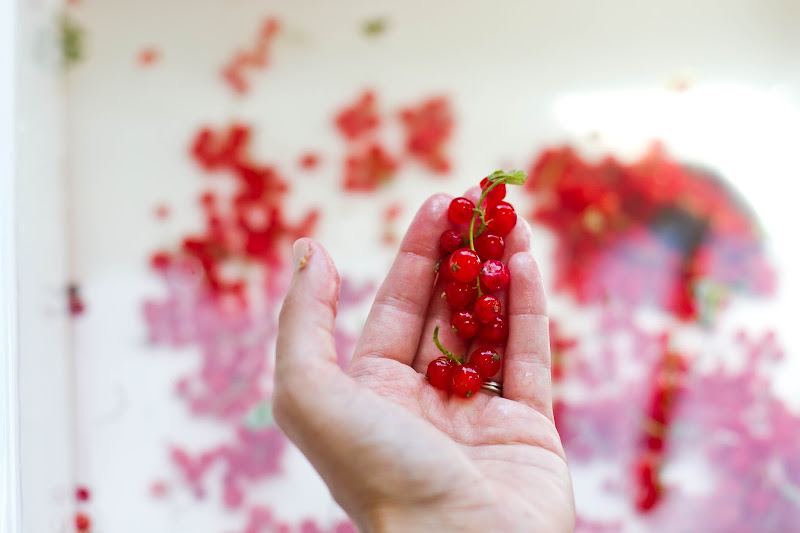 Top and tail the currants. (I assumed this was British-speak for removing the stems from the currants?) Rinse them under cold water and tip, still wet, into an ovenproof baking dish. Scatter over the superfine sugar and toss gently. The sugar will stick to the berries like frost. 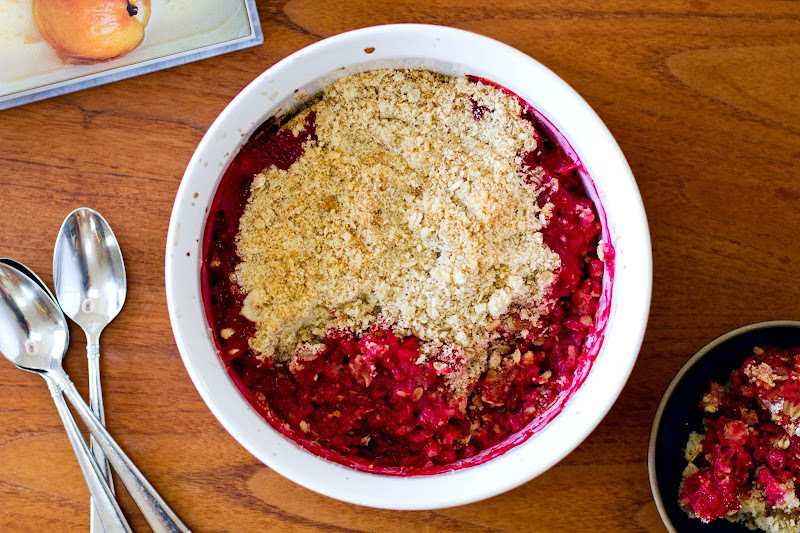 Tip the crumble over the sugared fruit. Don't pack it down. Bake for fifty minutes to an hour, until the fruit bubbles through the crust. wait. 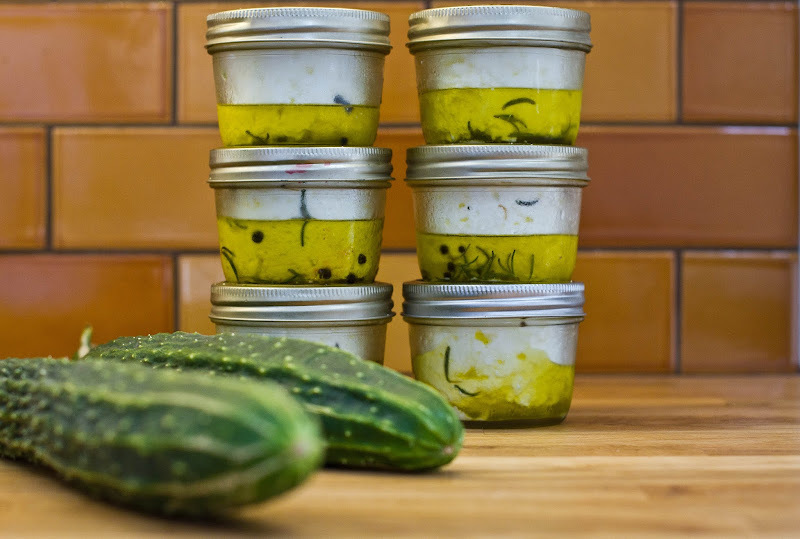 what's in the little jars?? That's the homemade goat cheese my aunt makes from her goats! So, I actually hate (*HATE*) Matt Damon. Its not personal-- I've never actually met him. I'm sure he's a very nice person. But something about his face makes me angry, and I can't watch things he's in. Jam went to see it alone, and didn't like it either. I can't remember why, I'll assume it was the FACE. 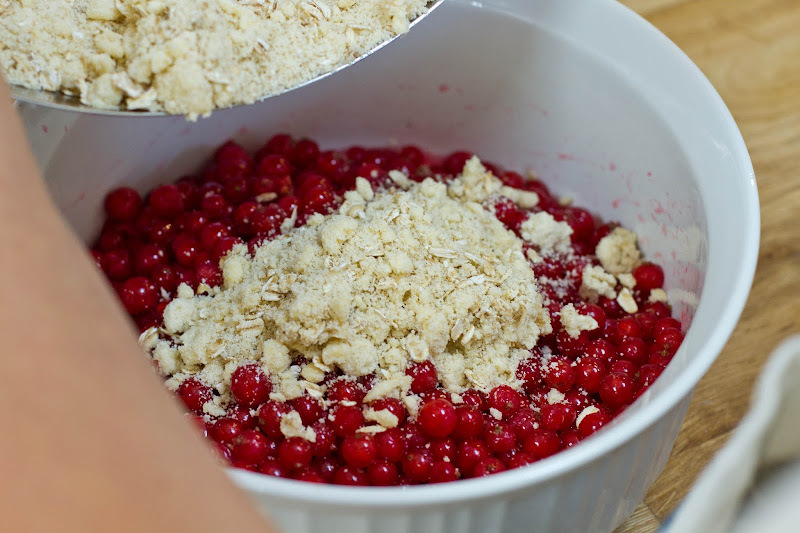 I love tart crumbles. 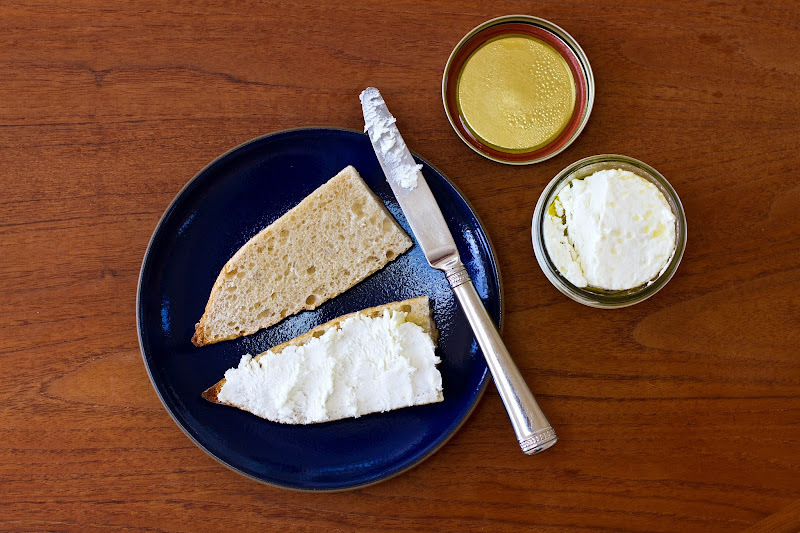 And I really want a loving aunt who brings me homemade goat cheese and redcurrants :). 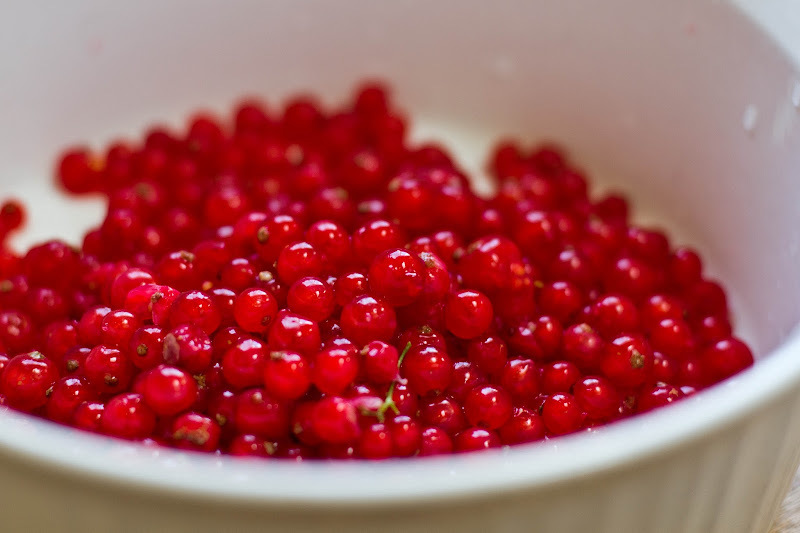 Currants get so bubbly in the oven! 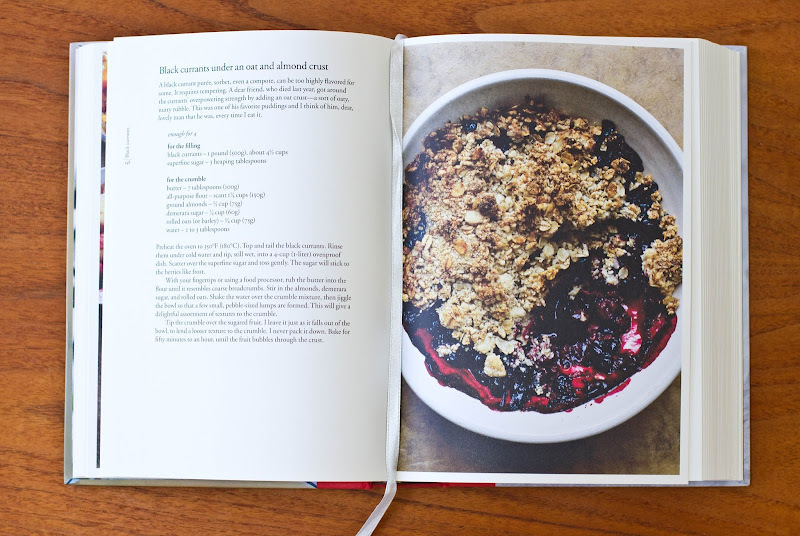 Perfect for crumble-making... this looks so good. I want to paint with that colour.